Public works is a practical endeavor. It involves supplying basic needs—water, roads, sewers, etc.—to citizens in the most efficient and reliable manner possible. In a word, it is all about functionality. When Fripp Island, S.C., needed a community sewer system a few years ago, engineers studied the local situation and the available options. Fripp Island is typical of many seaside resort communities in topography and geology—it is mostly flat with sandy soil. Many homes in the area at the time relied on septic systems for sewage treatment, but the abundance of them in close proximity created a groundwater pollution problem that affected the local environment. A sewage collection system and proper treatment were needed to solve the problem. In such situations, civil engineers typically turn to gravity sewers as a practical solution, but on Fripp Island, gravity sewers were impractical. The sandy soil, flat terrain and high water table would have made trenching difficult, expensive and inconvenient for local residents. A gravity sewer also would have required multiple lift stations, which are expensive and unwelcome in affluent communities like Fripp Island. The engineers estimated the cost for installing a gravity system to be in excess of $5 million; it would serve approximately 5,000 people in the summer months, but only 1,000 people the remainder of the year. Seeking more affordable alternatives, planners looked at both low-pressure grinder pump systems and vacuum sewer technology. The low-pressure option was estimated to cost $4 million, but officials had concerns about long-term maintenance. Vacuum sewers cost even less—approximately $3.6 million—but the consultants and public works officials were largely unfamiliar with the technology. After meeting with representatives from Airvac, a provider of vacuum technology, as well as other municipalities that had vacuum sewers, they discovered vacuum sewers were not only affordable, but also very practical and functional, for a variety of reasons. With conditions such as those on Fripp Island, installing vacuum sewers is much easier than installing gravity sewers. Vacuum collection lines are buried at shallower depths, typically 2 to 6 ft, so far less dewatering is necessary for installation. Gravity lines would have required trench depths of up to 20 ft. Vacuum sewer installation also requires smaller excavation equipment, and the collection lines are made of Schedule 40 PVC pipe, which is lightweight and easy to work with. Buried obstructions are not a problem, as the pipes can simply be routed around them, usually without change orders. All this is important in a fully developed community filled with expensive vacation homes. Vacuum stations can be equipped with backup generators to provide power should electrical service be disrupted. This is a significant benefit in a coastal community where tropical storms and hurricanes frequently strike. In the aftermath of a storm, public works crews can focus on other emergencies without worrying about sewer service. Each home and business on the island is connected to the vacuum system by gravity lines, so modifications to home systems were unnecessary. Typically, one or two homes are connected to a buried valve pit near the street. When the amount of liquid in the valve pit collection tank reaches 10 gal, the Airvac valve opens and differential pressure propels the contents into the collection line. The valve pits operate pneumatically so electrical connections are unnecessary. On the rare occasions when a valve needs adjustment, workmen can easily access the valve and typically have it repaired in minutes. The sewage from the collection tank travels rapidly through the line, at approximately 15 to 18 ft per second. This scours the line to help prevent grease buildup or blockages. The sewage is collected in tanks at the vacuum station and then pumped to the treatment facility. Fripp Island public works employees appreciate the easy maintenance required for the Airvac system. They check the vacuum station daily to monitor the vacuum pressure gauges. Callouts are rare, but when line or valve pit maintenance is required, it usually can be performed quickly and easily, and rarely do the workers come in contact with raw sewage. Vacuum pumps and valve parts have proven very durable. They typically last for years, if not decades. The long-term savings in manpower and parts are benefits the city continues to enjoy, even 10 years after installation. Vacuum sewers are closed systems, meaning there is no infiltration or exfiltration. Preventing infiltration is important because neither the high groundwater table nor the frequent rainstorms add extra burden to the treatment facility. Also, the collections lines do not leak unless somehow damaged; no sewage exfiltrates to pollute the environment. If a leak occurs, it can be quickly detected and easily repaired. Only one vacuum station serves the approximately 800 homes and businesses on Fripp Island; a gravity system would have required multiple lift stations. This was a significant savings of real estate, materials and energy. As a long-term solution, it is far easier and cheaper to maintain one facility rather than several. Also, the vacuum station was designed to blend in with existing architecture and is approximately the same size as the homes on the island. It is odorless and relatively quiet, so neighbors are unaffected by its presence. In almost every repect, vacuum sewer technology has been a practical, functional solution to the sewer issues in Fripp Island. 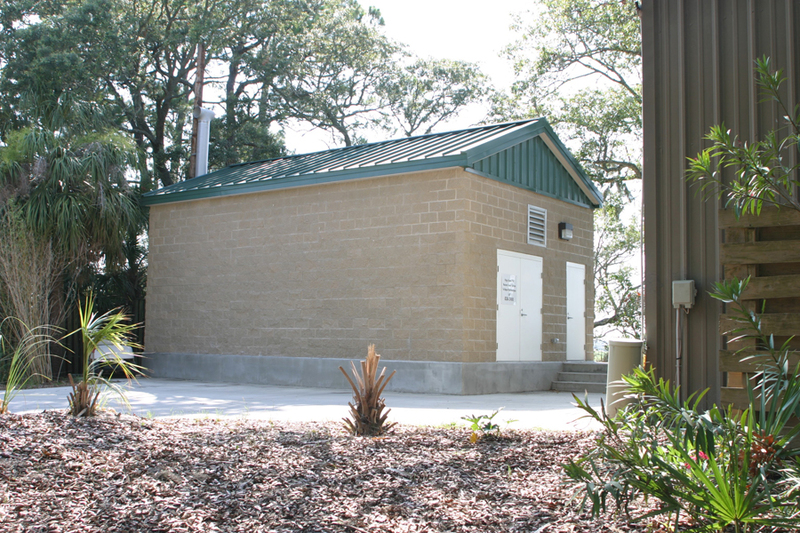 Easy to install and maintain, cost-effective and efficient, Fripp Island’s Airvac system solved its septic system problem and has helped restore the surface waters that make the area an attractive place to live.